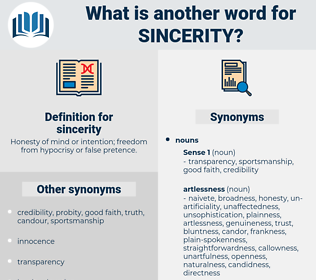 What is another word for sincerity? Honesty of mind or intention; freedom from hypocrisy or false pretence. 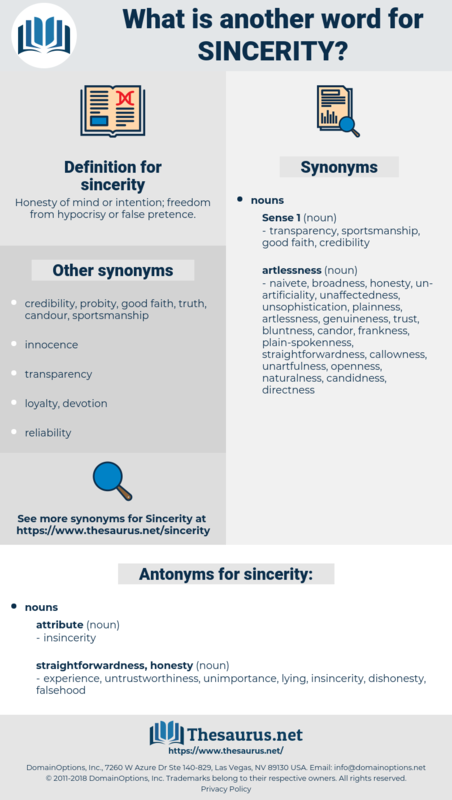 frankness, truthfulness, genuineness, earnestness, sincere, candor, candour, seriousness, faithfulness, authenticity, credibility, openness, earnest, integrity, probity, loyalty, goodwill, dedication, veracity, fairness, faith, directness, trustworthiness, willingness. experience, lying, falsehood, untrustworthiness, dishonesty, unimportance. His sincerity was shown by the fact that he spent most of the fortune, which his great capacity for business enabled him to make, in endeavours to put his theories into practice at various places both in Britain and America. They have only met once; and her opinion was expressed to me with evident sincerity: " Your sister is a nice girl, but she is like other nice girls - she doesn't interest me."